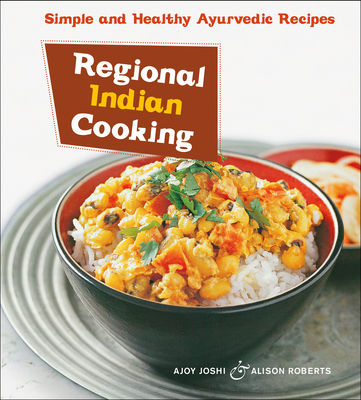 Regional Indian Cooking celebrates the cooking styles and regional specialties of the five principal regions in India--North, South, East, West and Central--each with a distinctive geography, lifestyle and culture. In keeping with the Indian philosophy of balance and the ancient principles of Ayurveda, author Ajoy Joshi makes it easy for cooks of all abilities to prepare unusual and delicious Indian dishes using only the freshest ingredients and spices that promote health and well-being. Each of the 120 recipes is presented in simple steps with helpful suggestions for tasty meat or vegetarian menus serving up to eight. Each region's cuisine has highlights to offer the home cook, from mouthwatering marinated kebabs of the north to the hot and spicy curries of the South. Emphasis on different ingredients distinguishes the East, with its use of mustard oil and curry leaves, from the abundant seafood and coconut-rich dishes of the West. The journey ends with the subtle melting pot of Central cuisine, which blends the best of the surrounding regions with centuries of global influence, and comes closest to defining Indian food around the world. Ajoy Joshi was trained in Madras (now Chennai), India and started his career at the prestigious Taj Group of Hotels, where as Executive Chef he orchestrated the opening of the now famous Karavali Restaurant, renowned for coastal South Indian Cuisine. Ajoy now lives in Sydney, Australia and is the chef and co-owner with Meera Joshi of Nilgiri's Restaurant and Nilgiri's(at)Home. Ajoy and Meera are sought after for their popular cooking classes and fabulous food demonstrations. Ajoy Joshi, with Jan Purser, is also the author of Indian Home Cooking (Tuttle Publishing). Alison Roberts has been a food editor, writer and recipe developer for more than 10 years and is a regular contributor to numerous food magazines, including Super Food Ideas. Alison's passion for food and healthy eating is reflected in Regional Indian Cooking. Alison lives in Sydney, Australia with her husband and two beautiful children.